day and make sure your litter never becomes Marine Debris? eventually make it to the oceans and become Marine Debris. Estimates suggest over a million seabirds may die each year and up to 100, 000 marine mammals and turtles as a direct result of Marine Debris. 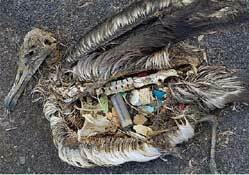 The Pacific Garbage Patch is one of many garbage patches in the oceans of the world. It is the largest and has an area twice the size of France. A very special thank you and congratulations to the schools who have already managed to go 100% Binless!